At the age of 24 and enjoying his first bit of fame at the major-league level, Lourdes Gurriel Jr. could not have picked a more inopportune moment to become aggressive. It was July 29 against the White Sox in Chicago and the Cuban rookie had just poked his third hit of the game for the Toronto Blue Jays. Not satisfied with that, Gurriel made the unfortunate decision (the Blue Jays were leading 6-3 in the top of the ninth inning at the time) to try to stretch the single into a double. Gurriel was tagged out at second and wound up injuring his left ankle in an awkward slide, landing him on the disabled list. The young Toronto infielder had been on quite the hit parade at the time, with his 11th successive multihit game. That tied him for the longest streak in American League history with Shoeless Joe Jackson (1912) and Sam Rice (1925). Gurriel returned to the Toronto lineup Friday night at Rogers Centre, playing shortstop against the Philadelphia Phillies, and hoped to make the record his own. While the Blue Jays beat the Phillies 4-2 win for their fourth successive win, Gurriel could manage just a lonely single to see his multihit streak grind to a halt. After going hitless in his first two at-bats, Gurriel found a hole through the left side in his third plate appearance in the fifth inning. That brought Aledmys Diaz home from second base for a 4-1 Toronto lead. But the streak came to an inglorious end when Gurriel struck out leading off the seventh in what would be his final at-bat. Ken Giles and Russell Martin celebrate the victory on Friday. While one streak ended another was extended when Kendrys Morales stroked a home run for the Blue Jays in the second inning that knotted the score 1-1. It was the fifth game in a row that the Toronto designated hitter has gone long, tying him with Jose Bautista for second in franchise history. Bautista went five in a row in 2014. Jose Cruz Jr. holds the team record at six straight games, set in 2001. Billy McKinney also homered, a two-run shot in the third that increased the Blue Jays' lead to 3-1. Ryan Borucki (3-3) had a sound outing. He allowed two runs off seven hits over 6⅓ innings to win the pitching duel against Philadelphia starter Jake Arrieta. The Phillies and first-year manager Gabe Kapler are one of MLB’s feel-good stories of this season. Booed by his own home-town crowd in the Phillies’ home-opener, after some curious handling of his pitching staff during Philadelphia’s initial road trip, Kapler has presided over a heady turnaround. After finishing last in the National League East a year ago, the Phillies arrived in Toronto nipping at the heels of the first-place Atlanta Braves, just three games back. And the Phillies still have seven games left to play against the Braves. Gurriel said before the game that he had not really thought much about his hit streak while he was off mending his ankle. “If it happens, it happens,” the soft-spoken Gurriel said through an interpreter. While Gurriel played down the streak, John Gibbons displayed a bit more of a pulse. When he posted the starting lineup against the Phillies, the Toronto manager had Gurriel batting leadoff for just the third time this season. “I hope he gets a couple hits,” Gibbons said. “In that leadoff spot, maybe get that extra at bat. It could come in handy, you never know. Lanky and long-limbed at 6-foot-2, Gurriel was an international signing of the Blue Jays in late 2016 after defecting from Cuba, agreeing to a seven-year, US$22-million pact. He made his major-league debut with Toronto in late April when his considerable promise began to show, being utilized at both shortstop and second base. The multihit streak had its beginnings on July 11 when he rapped out a couple of singles against the Braves. It continued unabated until July 29 when he tallied three and then hurt himself. For three days all teams will wear strange-looking alternate jerseys and players are invited to display their nicknames on the back. 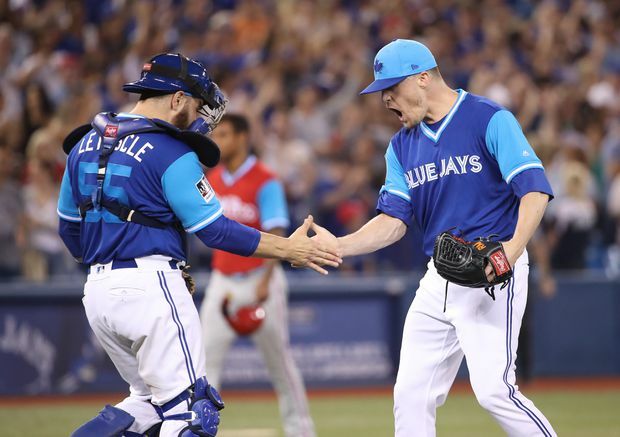 For the Blue Jays, that resulted in several inspiring monikers, including “Clip” for Tyler Clippard, “Dru” for Brandon Drury and “Grich” for Randal Grichuk.